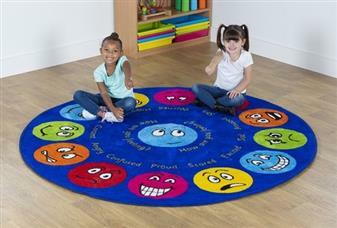 Emotions Carpets, including the Emotions Rectangular Placement Carpet, and the Emotions Circular Placement Carpet, ideal for primary school, nursery school, pre-school, play school, and early years and recommended for classrooms and soft reading/play areas. 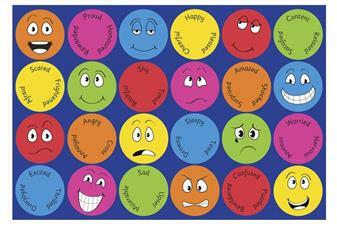 Both rugs are highly visual and have 12 different emotional/feelings expressions with keywords to encourage group discussion about feelings and interaction. 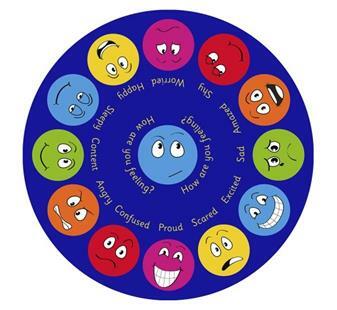 Children can choose an expression to sit on during reading and group lessons. The carpets have the dual purpose of serving a functional use around the school and also providing a daily visual reminder of this important subject. Both carpets have a safe anti-slip backing, tightly bound edges to prevent fraying, a high quality soft textured tufted pile for comfort and durability, and meet all relevant safety and fire standards. Suitable For Primary School, Nursery School, Pre-School, Playschool Etc..